Something new appeared on my trails today and I don’t get it. It says it’s a Pet Waste Station, but since when are pets a waste? I mean, that would be really sad if someone thought their pet was a waste and decided to throw their pet away. What if that pet thought they were going for a walk on my trails, and then when they got this far their person took them and threw them into that big green box? Maybe a cat would fit in that box. Or even a little dog. But what if someone tried to fit a dog as big as me into that box? That would be a pretty tight fit. Or what if bunches of people decided their pets were a waste on the same day. It could get pretty squishy in there. But maybe someone would find a pet already in the box that they liked. That they didn’t think was a waste. Would they take that pet home with them then? Then that pet wouldn’t be a waste after all – so what was it doing in the pet waste box in the first place? This whole pet waste thing is totally confusing to me. Maybe I’d better check this out and see if there are any pets around who think they’re a waste. I’ll tell them they’re not a waste and let them out of the box. Well, unless they’re cats, that is. Nope, I don’t see any pets around here. I guess nobody’s going to use this box after all. 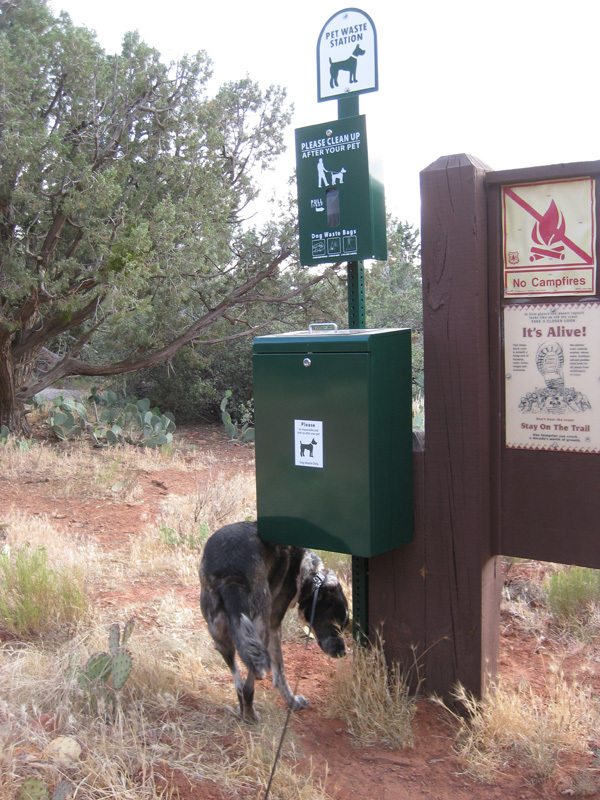 Good work, I guess they see you out on the trails so much that they are making it extra pet friendly. Now that is not a waste! Will and Eko, I guess now my trails will be pet friendly for all the pets who aren’t a waste after all. “Pet Waste”? Oh, now I see! Maybe they mean that you have to go out on a cleaning mission. Well, I hope they’ll give you “fish & treats” for it! Humans! Marina, at first I was going to balk at a cleaning mission – until you mentioned fish and treats. Their waste if poo just like your poo and mine is also a waste..toi bad irresponsible dog owners do not use the box to discard their dogs poo….otherwise I would not find their poo all over my well groomed front and back yard…. Karmami, maybe we should put this waste box in your yard. That’s terrible when dogs do their business in other people’s yards. 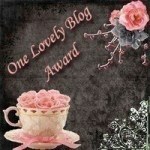 Thanks for stopping by and commenting. Viciously Sweet, at least you’re making sense more than most humans. I’m also concerned about how hot it would get in there. It’s really hot outside right now. Bongo, Molly here. Looks to me like someone finally peeked in on RC playing with her mousie. One cat wasted on catnip if I ever saw one…..but people don’t like to talk about that around here. Molly, at least if RC is wasted on catnip you can harass her easier. The cats around here don’t seem to care much about catnip. I think maybe it’s so dry here that the catnip dries out and isn’t much good. Too bad or I’d get my cats wasted and then I’d roll them. Molly, I like to take my paws and roll the cats over. For some reason they don’t like it when I do that. Benny & Lily, you’re so right. I don’t think I’ll ever figure people out. I used to be a waste when I was living in a kill-shelter far away from here. Then I was rescued, so now I am not a waste anymore!! Keep checking, B. If any pets get dropped off, you can rescue them! Cupcake, I’m sure glad you’re not a waste anymore because you’re a pretty cool dog. I’ll keep checking that Pet Waste box. I wouldn’t want any pets to be a waste. I’m glad Bongo that you scout this, humans have weird ideas. Thanks Tutti. I’m still trying to figure out humans. I don’t think I ever will. Your right Bongo…That sign makes no sense at all…Woof…Woof!!! Penny, maybe you can come here sometime and help me figure out what that sign really means. Maybe in the fall, A friend of ours just moved into the Sedona area and she loves it. She is a Musician / Teacher…Teaches music. If we visit her, we could visit you guys at the time…Woof..Woof from Penny. Penny, that would be so cool if you come to visit and hang out on my trails with me. Kevin, I’m not sure why your mom would want one of those things where you live, but maybe you can rescue all the pets that someone thinks are a waste where you live. I sounds like we may have to recruit a dog in France to rescue the pets there. 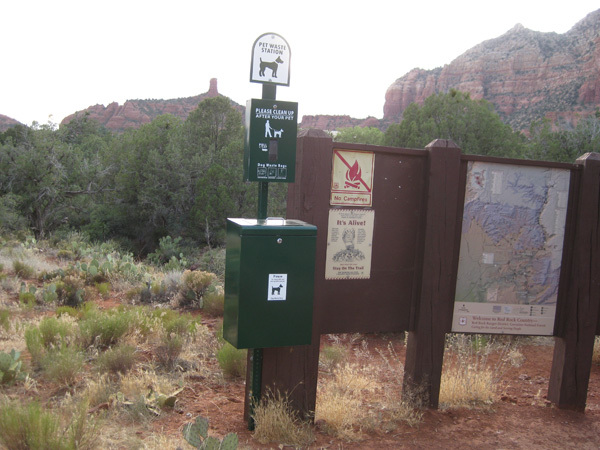 Pet Waste Station might even mean that it is a place where pets can free themselves from their persons. The boxes are for the useless leashes. Kolytyi, I’m so glad you figured that out. I think I’ll stick my leash in there the next time I go by that box. Lola, I wouldn’t be in too much of a hurry letting out those cats and little yippy dogs. But the big dogs we can get out right away. Bongo, are you sure there’s nobody in the box? No smell of any sign? Little Binky, there was no rattling around or smells from inside that box. But I’ll keep checking every time I go by. i think that’s a good box pal, and one you will use time and time again!! Dalton, as long as somebody doesn’t try to shove me in it. It could get hot and cramped inside.